Happy Monday ladies! How about that Furman game? Sammy Watkins made an official debut this season with a nice 58 yard touchdown, and Tajh Boyd continued to impress with great first half pass completion stats. While the Tigers pulled out a nice solid win (41-7) over Furman, we still saw some opportunities for improvement - especially with our defense as we head into next week's big, first away game and first ACC battle vs. Florida State. 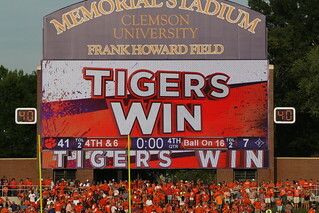 For a complete review of Saturday's game vs. Furman, please read this great recap article from TigerNet. We have some great gameday photos from this past Saturday's Clemson vs. Furman game - special thanks to our resident photogs Summer Priddy and Katie Schalkoff. Also, a big thanks to all of you who submitted your gameday photos to share in our album! If you would like your gameday photos to be added to our album, please email them to us at clemsongirlblog@gmail.com. Would you like to be a Clemson Girl gameday photographer? Email us at clemsongirlblog@gmail.com and let us know if you're interested! Stay tuned to the blog this week for more exciting giveaways and new Clemson Gameday Looks.